Welcome to Voodoo Guitar, a site about guitars & gear, from vintage to new. As a guitar player, sound engineer, and general gear connoisseur, I thought I’d begin sharing information gathered over the years, along with demos, photos, videos, and anything else that might be interesting. During the musical explosion of the 1960s in London, it was common for music stores to design and build their own equipment for sale at the shop; each neighborhood retailer would try to outdo the other, along with a good bit of copy-catting, of course. This is essentially how Marshall, Orange, and Vox all came to be, and as happens in most free-market industries, competition would arise. 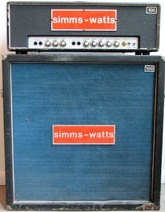 Two of the rarest, loudest, and best-sounding competitors were Sound City and Simms-Watts, and both are profiled here. To begin discussion of Sound City amps, we must go back to one of several London music shops owned by Arbiter Electronics, half of the Dallas-Arbiter, Ltd. musical conglomerate. The original music superstore chain, they sought to cover the bases of all the equipment a band might need, from guitars and amps to drums and PA systems. 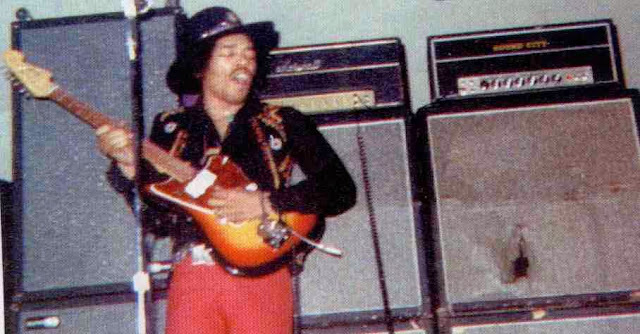 In 1966, Arbiter began producing the Fuzz Face Germanium fuzz pedals that Jimi Hendrix made extremely popular, as well as Dallas with the Rangemaster Treble Booster a year prior, used by Eric Clapton, Ritchie Blackmore, and Brian May, among others (both of these products were answers to similar Vox units, as well). Depending on where and when it was purchased, it could be an Arbiter-labeled product, or Dallas Music Industries, or that of whichever shop sold it. In the back of one of these West End shops, appropriately named Sound City, Dave Reeves would design and build the SC105 "One Hundred" model amplifier, a high-headroom 100-watt EL34 answer to the Marshall Super Lead "Plexi" head. 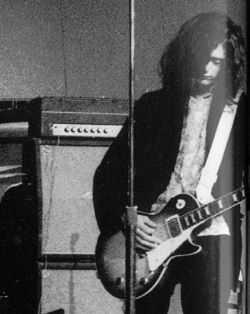 and Jimmy Page playing thru possibly that very same Arbiter head (right). Reeves, who started his own company, Hylight Electronics, in 1966, needed capital to start manufacturing his own amplifiers, and agreed to a contract as Sound City's chief design engineer for a period of time. 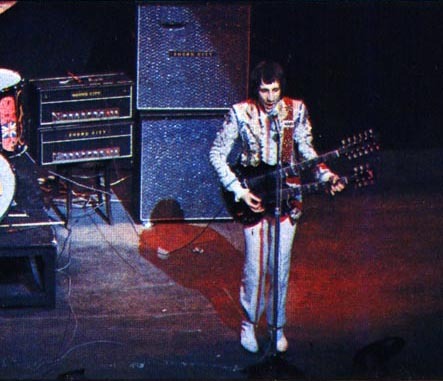 When the One Hundred design went into production as the Sound City L100 in 1967, Pete Townshend and John Entwistle of The Who began using them immediately, as they preferred the loud, cleaner tone of the L100 to the Marshalls they had been using prior. Jimi Hendrix was turned on to them by The Who, and used some Sound City stacks along with his Marshalls for a brief period, along with Jimmy Page, who used a very rare Arbiter-branded "Power One Hundred" head in '68-69. 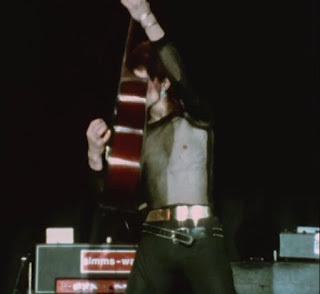 At one point, Townshend had his amps modified privately by Reeves, which began a working relationship between the two that would last quite some time. Reeves, a perfectionist, wanted his designs to utilize the highest-quality military-spec components possible, but Dallas-Arbiter wanted sales, and cost-cutting was often pushed by his employers at the sake of quality. They were interested in competing with Marshall by offering a more affordable product to the working musician, rather than higher quality. 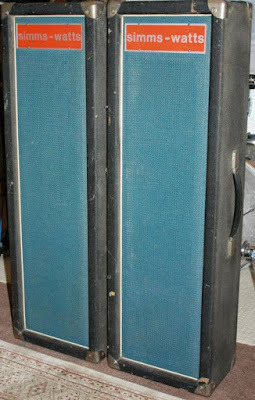 Reeves wanted to use high-quality Fane speakers and hardwood cabinets, Arbiter wanted to go with cheaper drivers and particleboard (some of the early Sound City cabinets are incredible, look for the Fanes! 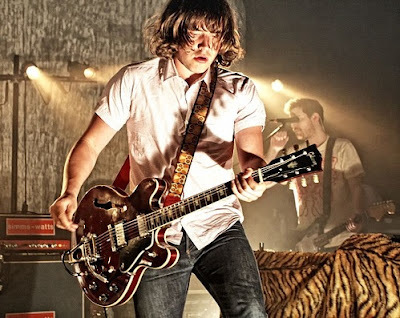 ); This created a friction that would not be resolved, and at the end of his contract, Reeves left Sound City and began building his own amplifiers, starting the Hiwatt amplifier brand of Hylight Electronics. His first model, the DR103 amp, shared many similarities with the original SC105/L100, but spared no production expense or attention to detail. 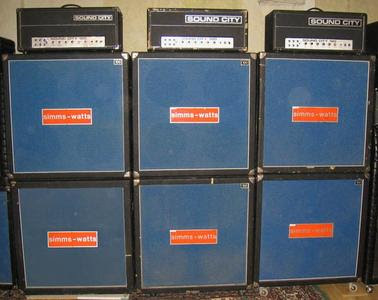 The next wave of Sound City products were based on Reeves' original designs and mirrored his Hiwatt models, as his former assistant, Denis Cornell, would go on to build the Mk2 and Mk3 versions of the L100, as well as the Lead/Bass 200 and 50 heads, using the ideas and techniques he learned from Reeves (The L/B200 was a monster 4xKT88 200-watt beast designed to compete with Marshall Majors and Hiwatt DR201 models; the 50 was a 50-watt competitor of the Hiwatt DR504). Cornell is currently a very well respected boutique amp builder, and has built tweed Twin-style combo amps for Eric Clapton, amongst others. the similarities go far beyond cosmetics. 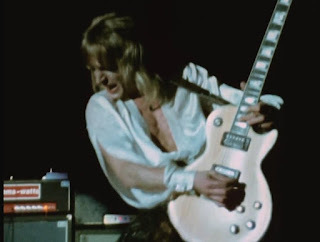 The Who stuck with Reeves, having their customized Sound City amps rebadged with Hiwatt logos, and the DR103 would evolve into a custom CP103 "Super Who" model that Townshend used for over a decade. Jimmy Page endorsed Hiwatt from their beginnings thru 1971, with a custom DR118 100-watt "Jimmy Page" model, and David Gilmour of Pink Floyd has also been a Hiwatt devotee from 1969 until present day, briefly seen using a Sound City L100 just prior to the company's start. 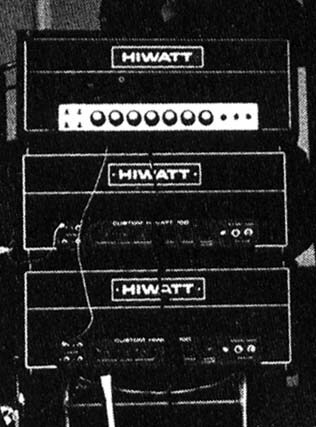 While Hiwatt went on to legendary status thanks to their no-compromise quality and high-profile endorsers, the very similar early Sound City amps can be found for a fraction of their cost, and sound fantastic, particularly the Mk1 (original), Mk2 and Mk3 models. Most later models labeled "Mk4" or "Plus" used an active EQ circuit, and begin to diverge considerably from the original Reeves design, as do the 120 and 150 models (not to say they aren't solid amps, just different). Pre-'72 seems to be the range to seek for the best of Sound City, or at least closest to Dave Reeves' original vision. David Simms ran a shop called the Musical Bargain Centre on Ealing Road in London, near both Jim Marshall's original store and where Monty Python would film many classic scenes. In 1968, Richards Watts was named technical director of the shop, and the Simms-Watts brand was born. It's notable that Rick Wakeman worked at the shop while studying at the Royal College of Music, and John Entwistle would drop in to rehearse with him (Entwistle would later endorse Simms-Watts, amidst stints with Hiwatt and Sunn amps, as well). 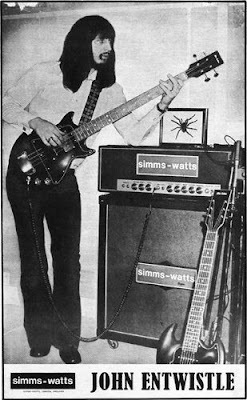 It's additionally notable that Terry Marshall, son of the late Jim Marshall and the "T" in the JTM line of Marshall amps, also joined Simms-Watts in 1968 after a falling out with his father. Like most competing retailers, Simms-Watts sought to outfit the entire band with amplification, from guitar and bass to keyboards and vocals, and they began offering some extremely high-quality products in 1969. 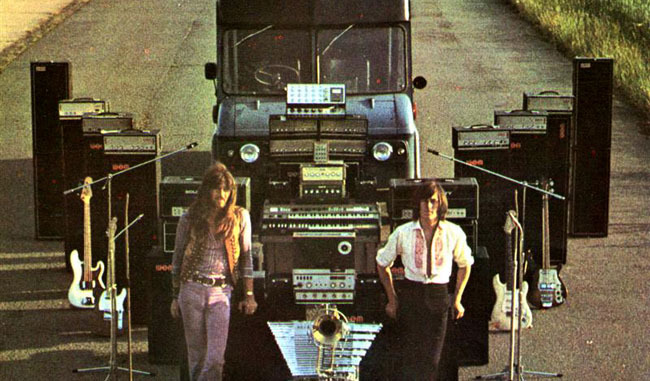 They designed two instrument amps, the AP (All-Purpose) 100 and 200 Super models, as well as multi-input tube-powered PA mixers, using only extremely high-quality Fane or RCF speakers in their cabinets. These amps used massive Partridge transformers, just as Hiwatt and early Sound City, and ran their tubes at an incredible plate voltage of over 600 volts in Ultra-Linear mode, gaining as much clean headroom before distortion as possible. The AP100 used EL34s, while the AP200 used a quad of KT88s, just like the Marshall Major, Hiwatt DR201, and Sound City L/B200 amps, and by utilizing this ultra-linear circuitry, created an even louder, cleaner amp at higher volume levels. 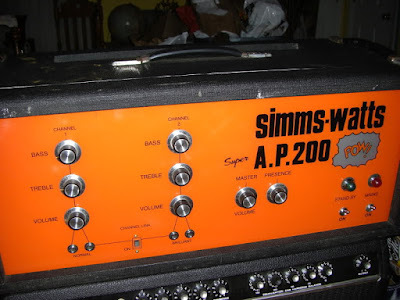 While I've never played an AP200, I can say that after my brief experience with the AP100, it might just be the PERFECT amplifier for fuzz pedals, not only due to the clean headroom, but it's warmth... these are ultra-clean amps, but far from sterile. Their tube warmth and optimal input circuitry can take the edge off a Fuzz Face or Tone Bender while allowing the fuzz to breathe, and guitar & pedal to interact without interference. Mick Ronson of David Bowie's Ziggy Stardust band may have agreed with me, as an AP100 can be seen onstage alongside of his Marshall Major, circa '72/73 (Bowie was rumored to have used it for his 12-string acoustic/electric, also). A stage backline made up entirely of Simms-Watts, featuring 8 4x15" PA columns and two full 4x12" stacks. This might have been the loudest concert ever. 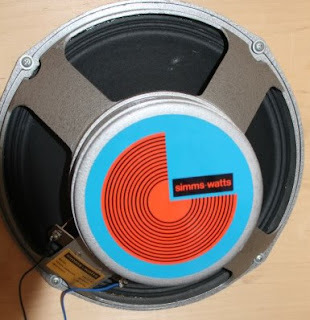 Simms-Watts made some incredibly unique equipment, with great cosmetic design as well as sonics. In 1972, they were purchased by EMI Sound and Vision, and although staying in production for several more years, a period of decline began, including the cost-cutting move to transistor circuits. Simms held on to his original shop until at least 1978, when a new Dave Simms Music Products store opened up, dealing mostly in PA and DJ equipment. 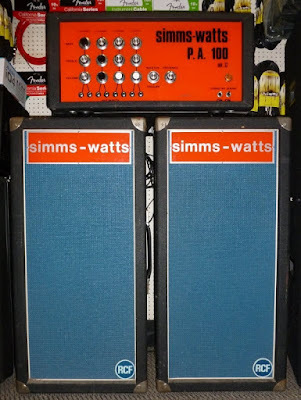 Richard Watts went on to work for several organ and keyboard manufacturers over the years, as well as Electro-Harmonix, but the early Simms-Watts models would be the only tube amps known of his design. 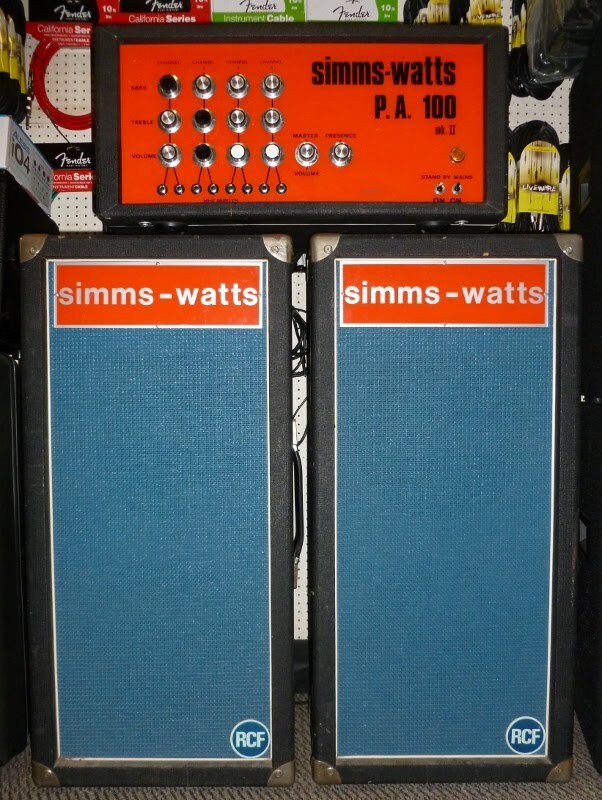 with an AP100mk2 & matching 4x12"
And perhaps the most appropriate picture of all, three full stacks of Sound City L100 heads atop Simms-Watts cabinets... the perfect conclusion to this oddball thesis. A very interesting and well-researched article. Thought I'd mention that Terry Marshall, Jim's son (and the T in the JTM series) worked for Simms-Watt after leaving his dad's company. Thanks! That's pretty interesting, prob right around the change from JTM to JMP I would guess? Never seen Partridge iron in a Simms. Lots being sold as having it, but never are. Denis Cornell designed and built the SC 120's also. Just to confirm that we did not use Partridge transformers in our amps. They were made by a firm near Rickmansworth and the guy who owned it knew one heck of a lot about transformers. They continued to make all our transformers until at least after the EMI takeover. Otherwise a fascinating and accurate write up of Simms-Watts. I think it is a very important issue to set up working relationship between the two that would last quite some time. What do you think? Wow, it was a really interesting post about the development of music since the 1960s in London. 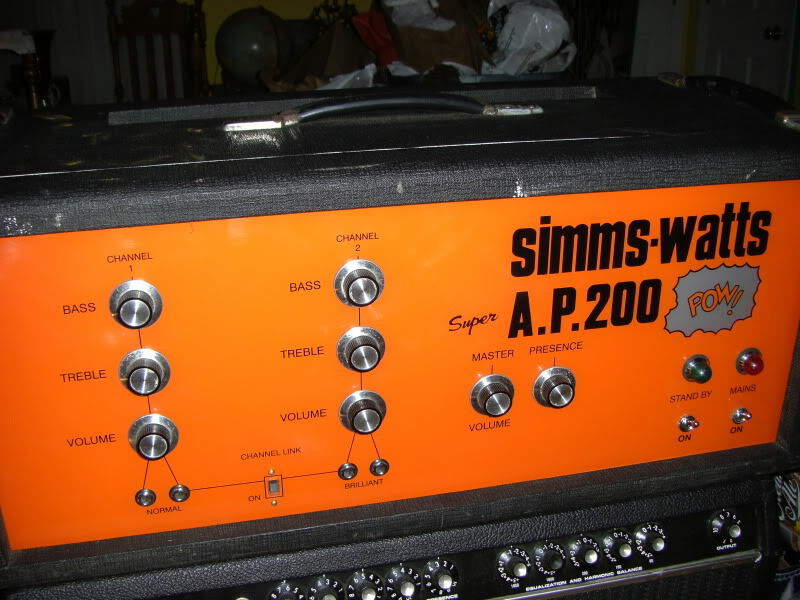 Simms-Watts made good music equipment. The pictures you showed are very cool and look like they have experienced much. 1957: Gibson Guitars, Korina wood, & Science-Fiction at it's finest. If you like an article, just $1 would help us make Voodoo Guitar even better! We're planning to improve our video production for gear demos and tutorials. Please contribute and help us make this site the best possible! !